Call Our Family Professional Termite Control Team! Our family owned business is focused on providing a comfortable and honest pest control experience for you and your family. We know how helpless you can feel when you have scorpions that seem to pop up around every corner and you feel like you have exhausted every option. We take this promise to heart and provide you with honest information about your problem and will prove to you how knowledgeable we are about your termite control problem by answering any questions that you may have. in the Phoenix and Greater Area trust Varsity for all their pest control needs. One of our customers recently remarked about a termite inspection conducted by Tony, saying that he had “called several companies, but Tony really stood out. The others used scare tactics to try to win my business. Tony though, presented himself as a knowledgeable, honest, and trustworthy person. Since selecting, meeting, and dealing with him all of these things have proven true. He’s been conscientious and accommodating. I feel like I was in good hands and I never have to worry about any critters being where they’re not supposed to be.” This is a typical experience that our customers are grateful for after dealing with less than ideal companies in the past. Our termite inspections utilize the most state of the art equipment, combined with years of termite inspection expertise, and expert opinions on each unique situation. 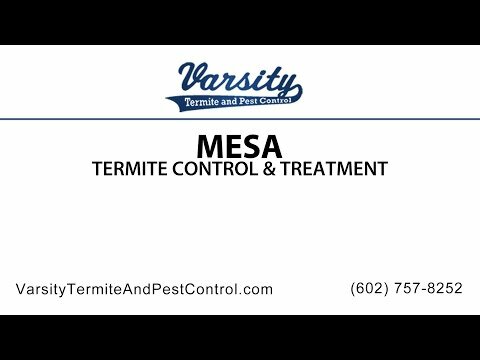 Varsity Termite is “your home team” when looking for mesa termite treatment. Our technicians are the epitome of professional, but definitely have that feel of “family”. We want to make all of our customers part of our pest control family and show that we care to treat your pest control issue just as much as you do. We differentiate ourselves from the big corporate pest control companies by treating you like you’re our only customer, and proving our expertise by being as informative as possible throughout your termite treatment process. We differentiate ourselves from a 1-2 man operation by having the manpower to schedule around your needs and always having a friendly voice answering the phones during business hours. Google Map pinpointing the location of Varsity Termite and Pest Control in Mesa, Arizona. They Did A Great Job With My Termite Problem! I Tell All My Friends About Varsity!